Welcome to the Historical Society of Rockland County's online “walking tour” of the Jacob Blauvelt House. 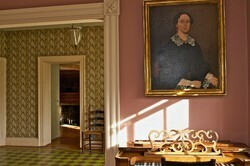 The historic house is open for personal and group tours by appointment and during the Society's special events. To arrange a tour, contact us at (845) 634-9629 or by email at info@rocklandhistory.org. Jacob Blauvelt was a great-great-great grandson of Gerrit Hendrickson, who came to this area from Holland in the early 1600s. Gerrit worked on a farm near Albany until he could purchase his own farm in New Amsterdam. By the late 1600s, seven of his fifteen children had left lower Manhattan to settle what today is Rockland County. The land that we are standing on was bought by Jacob Blauvelt's great-grandfather in 1741 and passed from father to son for the next four generations. Jacob and his wife, Margaret, had been married for sixteen years and had five children age two to fifteen when this house was built around 1832. The property also comprised one hundred acres of arable land, a large Dutch style barn, a vegetable and herb garden, a woodlot, and several outbuildings. The Blauvelt house is one of the few remaining examples of the Dutch-Flemish architecture that was once prevalent throughout Rockland County. It was constructed in three sections: the main house, the common room, and the out-kitchen. The main house dates from the circa 1832 and is constructed with a mixture of hand-hewn and machine-sawed lumber and bricks from nearby brickyards. The Blauvelts were a middle-class family. The style of the house, its furnishings, and its decorative elements all reflect that of a typical family of this area in the early to mid-nineteenth century. Members of the Blauvelt family lived in the house from its construction in 1832 until 1970, when it was given to the Historical Society of Rockland County. During their more than one hundred years living in the house, the Blauvelts many modifications to it. When the Historical Society of Rockland County gained ownership of the home, it was restored to its original period and furnished with original Blauvelt family pieces, as well as Rockland County and Lower Hudson Valley pieces from the Society's collection. Few rural families could afford to replace all of their furnishings as styles changed. Instead, as we still do today, they kept old pieces and passed them down to their children and grandchildren. The Blauvelt House illustrates this blending of the old and the new in its woodwork, wallpaper, and floor treatments. If you lived in Rockland County during the 1830s, when the house was built, you probably would have made your living as a farmer, like Jacob Blauvelt. As we move through the house, keep in mind that family life was structured around the changing seasons. Each day started and ended with chores for each member of the family, from cleaning, cooking, and mending to feeding and grooming animals; sowing, tending, and harvesting crops; and preparing salable goods for market. The floorcloth in the front hall is a beautiful and practical item for a rural farmer's main entryway. The cloth is made of heavy canvas, stenciled or painted with a pattern and sealed with several layers of varnish. Cloths like these were considered stylish yet practical. Mud and dirt were easily removed by mopping. The wallpaper is a reproduction of the roll-printed variety. Roll-printing replaced the individual block print method and was relatively inexpensive because it could be manufactured in America rather than being imported from England or France. Candles were the only source of light once the sun went down. Often mirrors would be carefully placed to enhance the effect of the light from the candles. A great deal of color was used in a typical 1830s home. The parlor's Venetian rug, rich cream and mauve wall, mantel, and moldings were all considered very up to date. In the 1830s, parlors were often furnished with a number of unmatched chairs that could be pulled around for conversation. In the winter, the chairs were gathered near the fireplace; in warmer months, they might be arranged near the windows or door. This room served multiple functions: entertaining room, family room, work room, office and more. It seems likely that the family did a great deal of entertaining in this room, especially during the winter months. Evening parties gave the Blauvelt adults a chance to mingle with friends, while providing an opportunity for chaperoned courtship for the young people. Guests might arrive by horse drawn sleigh or coach. The room would be illuminated by candlelight, with the table set with food and drink. The hosts and their guests might spend time singing popular songs. These songs were often accompanied by flute or piano. Parlor games like twenty questions, charades, puzzles and riddles were enjoyed by all. Women often brought sewing or embroidery projects to social gatherings. The Blauvelt bedroom was used in much the same way that we use our own bedrooms today, with a few notable exceptions. The similarities include its use as a dressing room, a place for storage,an area for sleeping and personal time between the adults of the family. Unlike modern bedrooms, it also served as the family birthing room. The bed has a simple frame strung together with ropes. A number of mattresses, called ticks, were placed on top of the ropes. This room and the attic were used as sleeping spaces for the Blauvelt children. There probably would have been more than one bed in this room. Children customarily slept two to three in a bed, in simple cots or trundles supported by ropes. Most clothes were stored in blanket boxes like this painted one. Typically children did not have a great number of toys, but the ones they did have were used to teach them the skills they would need later in life. Tiny toy irons, churns and cooking tools, miniature carved figures of animals, dolls and wagons are some examples. Toys were usually stored in the barn or in the common room rather than the bedroom. A common room of the nineteenth century was a place that served numerous functions. It was an informal place where the family could gather and discuss the day's events. The young children probably played here while the older children did their homework and helped with household tasks such as sewing, mending, laundering and cooking. The central focus of the room was the fireplace, which was used as a source of heat, a place to cook and to heat water for laundry. As in our own home, many things might be going on in this room at the same time. One child might be making butter in the churn while another sat at the table doing arithmetic homework or practicing penmanship. The toddlers might help by scrubbing potatoes or shelling peas. It took everyone's cooperation to keep the household running smoothly. Work in the kitchen was most intense during the late summer harvest when fruits and vegetables were preserved, pickled and canned. With the increased activity came an increase in social time. Women frequently hosted "apple bees" where neighbors would arrive, paring knife, bowl and apples in hand to share conversation and work. Out in the barn, threshing parties gathered neighbors together to work by day then dance and drink by night. The mix of tools in the kitchen reflect a blend of English, Dutch and American culture. Just like our own homes that display a mix of old objects alongside newer ones, the Blauvelts lived with family heirlooms and newly purchased pieces. Some important kitchen tools, found in nearly every 1830s home include a crane, used to bring pots forward and back and trammel to adjust the level of the pots. These two tools helped cooks regulate the temperature of their food, much the same way we adjust the racks closer or further from the broiler in our ovens. Many of the tools in this kitchen are directly related to our own kitchen gadgets. Although most of these historic tools are made of iron, brass, wood and ceramic instead of our aluminum, Teflon or plastic, you will notice obvious similarities. Breakfast: In the 1830s farm breakfast was usually served between 7 and 8 AM usually after the completion of one or two hours of early barn chores. The type of food varied depending on the season and weather. Period breakfast foods include cornmeal mush, oven baked bread, butter, scones or griddle cakes, potato hash, herring, fresh berries, tea and coffee. Some breakfasts also included roasts, steaks and chops, broiled fish, boiled potatoes, cheese, cheese pies and beer. Noon dinner: A large dinner served at noon was the next meal. Pea soup, mutton broth, venison, meats and fish, fresh vegetables, relishes, cole slaw, breads, pies, coffee, tea, cider, ale and beer. In the busy summer months, Jacob and his family probably took the period equivalent of the boxed lunch, a basket of bread and cheese, to the fields instead of coming into the house for lunch. Tea time: Originally a break between the heavy noon dinner and supper, it traditionally included tea, simple buttered bread and cakes. Here in the New World, tea time gradually moved to a later time of day, becoming the evening supper for many farm families. The food also changed dramatically to include smoked beef, sliced ham, roasted chicken, waffles, wafers, pancakes, fresh fruit and cheese. Supper: If a fourth meal was served after tea, it was likely to be supper, taken at about 9 PM. This meal was usually small, consisting of fresh apples, leftovers, bread with butter, milk or cheese or porridge. Supper was usually served cold and was flexible depending on social life and work schedule. This concludes our tour of the Blauvelt House. Thank you for visiting our website, and we hope to see you soon at the Historical Society of Rockland County!